A customer asked me the other day why I don’t do quilts with the t-shirts cut all different sizes and laid out in a random fashion. 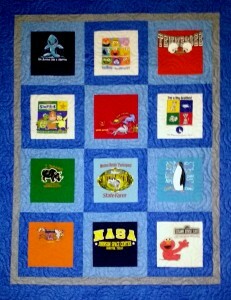 I have seen some random t-shirt quilts that I liked and some that were way too busy for my taste. However, it is just a matter of personal preference. Having a more traditional background in quilting, I prefer the more organized grid method of t-shirt quilt layouts. On the rare occasion that I let someone talk me into making a random t-shirt quilt, I found that the time involved in cutting different sizes of squares and rectangles and then making them fit into a quilt just wasn’t going to work for me. Every random quilt would take two or three times more out of my busy schedule than the grid method. So I would have to charge two or three times more for random quilts. That just doesn’t fit into the average customer’s budget. 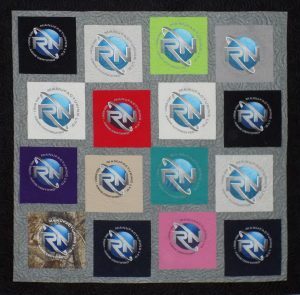 The most common t-shirt quilts that I make can be seen on my Order Form page. However, the ones pictured are also options that are a little different and I am happy to do these as well.